In the spring of 2017, “Coni” invited the YCDSB and TCDSB to participate in a Track & Field event which would take place in June through Centro Scuola Athletics. Through the International (Heritage) Language Department at St. Gabriel the Archangel CES, 5 students were given the opportunity to participate. 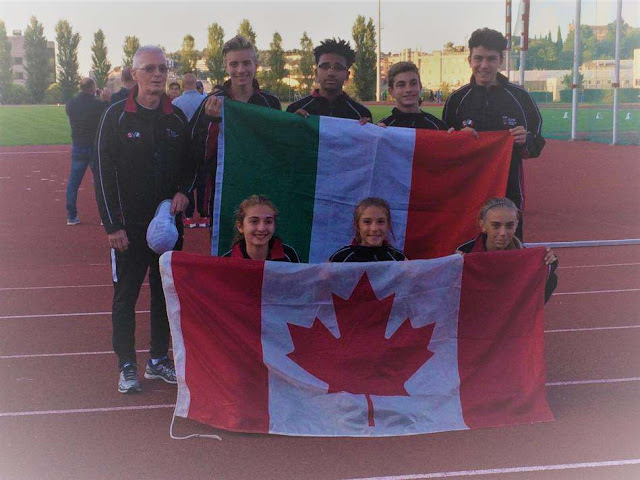 They attended training 3 times a week at York University’s track facilities under the guidance of Phil Riddell, head coach at Centro Scuola and Signora Franca Tucciarone, International language teacher at St. Gabriel. As a result, our very own St. Gabriel student, Giancarlo Varano (now Grade 8 student) placed 1st in High Jump and earned a spot on Team Canada set to compete in Italy in September 2017. Giancarlo continued to train all summer with Centro Scuola. Giancarlo traveled to Italy with his mother to participate in the competitions. The competition in Italy consisted of 20 teams plus Team USA, Team Svizzera and Team Canada. It is with great pride to report that Giancarlo Varano placed 1st in High Jump, 2nd in Vortex Throw and 3rd in 60m. Giancarlo placed 2nd overall in his Triathlon competition. Thank you to Signora Tucciarone for always encouraging our students to seek excellence in their Italian studies and also for providing St. Gabriel students with many rich cultural experiences such as this one and many more through the Italian program at St. Gabriel. What an experience it must have been, we are so very proud of you! Congratulations Giancarlo! Giancarlo - Backrow: 1st on the right.